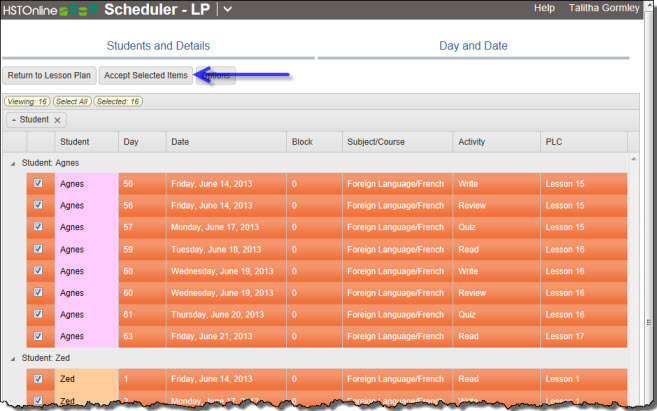 After you create your Lesson Plans you will use the Scheduler tool to create the actual Assignments for your Students. You can access the Scheduler from the Student: Lesson Plan and Presets area or from the Lesson Plan page. Scheduler from the Student: Lesson Plans and Presets area: Choose to create Assignments from one or more of the Student's Active Lesson Plans. HSTOnline will pick up where you last left off in that plan for the Student and create the Assignments needed to fill your selected date range, or until all un-used Lesson Plan items have been utilized. 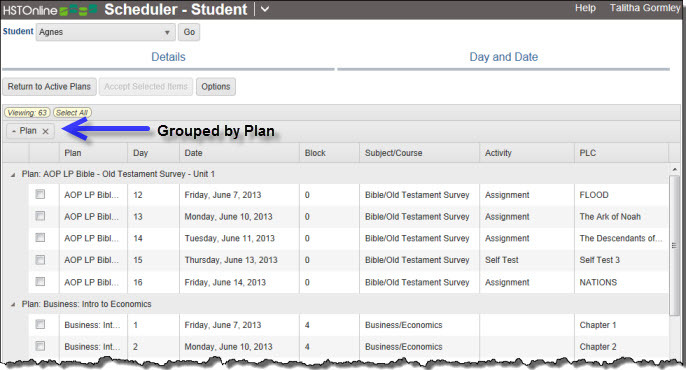 Scheduler from the Lesson Plan area: Choose to create Assignments for one or more Students from the same Lesson Plan. HSTOnline will pick up where you last left off with each Student in the Lesson Plan, or you can select specific items from the Lesson Plan to use with Scheduler. Items will be created to fill your selected date range, or until all the un-used Lesson Plan items have been utilized for each Student you have selected. From the Student: Lesson Plans and Presets area you can use the Scheduler tool to create Assignments from multiple Lesson Plans at the same time for one Student. You can set a Daily, Weekly, Monthly or Spread Evenly pattern for HSTOnline to follow, or choose to use the Presets you created for the Student. If you are using the Lesson Plan feature, creating an Active Lesson Plan list for your Student will help you keep track of how far they have progressed through each plan. You can add or remove plans from this list at any time. HSTOnline will remember the 'used' status for each Student in each plan whether the plan is listed here or not. Resetting the Used Status of Lesson Plan items for a Student will update this list accordingly. On the HSTOnline Menu, click or touch 'Lesson Plans and Presets' under the 'Students' section. On the Lesson Plans and Presets page, select a Student from the drop down list and click or touch the Go button. Click or touch the Edit button to see the list of all your active Lesson Plans in your database. For each Lesson Plan on the list, you will see the total number of items in the Lesson Plan, the number of items remaining to be used to create Assignments for the selected Student, and the date on which the last Assignment was created from this plan using the Scheduler tool. Click or touch the Active checkbox to add a checkmark to any Lesson Plan to add it to the Student's list. Active Plans to return to the Active Lesson Plan list for this Student. Preset to add, edit or delete preset entries for this Student. Scheduler to use the Scheduler tool to create Assignments for this Student using one or more of his Active Lesson Plans. When using Scheduler from the Student Dashboard, you can create Assignments for your Student using some or all of their Active Lesson Plans. 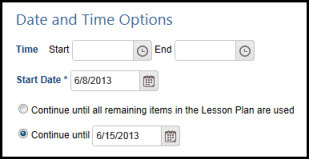 You can choose to create Assignments for a specific date range, or to create Assignments from all the remaining un-used items in the Lesson Plans for that Student. Click or touch the Scheduler button. 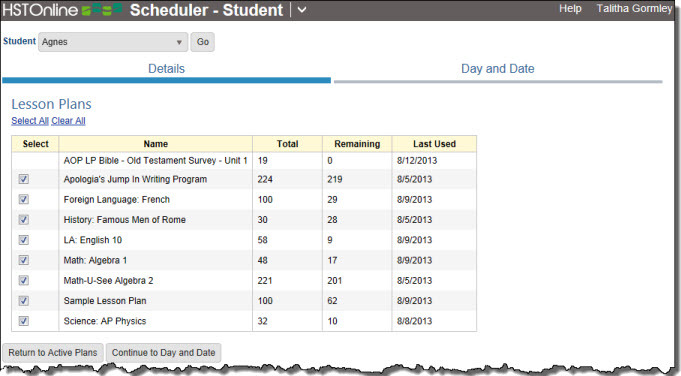 The Scheduler - Student form is a tabbed area with two sections: Details and Day and Date. The active area is indicated by a dark blue line under the tab name. Go to the Leeson Plan in question and reset the Used Status for the items needed. This will update the Active Lesson Plans list and you can then use Scheduler from either the Student or Lesson Pland side. Click or touch any checkbox to remove the checkmark to exclude that Lesson Plan from this Scheduler session. You can click or touch the 'Select All' or 'Clear All' links to quickly add or remove all checkmarks. Return to Active Plans button to abandon this process and return to the Student's Lesson Plans and Presets page. Continue to Day and Date or the Day and Date tab to move to the next set of options. Day Options: Set the pattern of days you want HSTOnline to follow when creating the copies. Skip Days off will cause HSTOnline to skip over any days that have already been noted as a Day Off within your school year. Preset: HSTOnline will follow the days and times for the designated Subject or Subject/Course that you have set in the Lesson Plans and Presets area for the Student. This option allows you to create the same type of Assignment for multiple Students at the same time, but set personalized days and times based on their Preset entries. Daily: HSTOnline will gather a list of all dates that fall within your selected date range, remove the dates that violate your 'Skip' settings, and then place an Assignment on each date in the date range according to your 'Every_Day' entry. Monthly: HSTOnline will gather a list of all dates that fall within your selected date range, cull the list to only those dates which match the date of the month or # day of the month you have selected (First Tuesday, Third Monday, etc.) and then remove from the remaining dates any that violate your 'Skip' settings. Finally, HSTOnline will place an Assignment on each remaining date in the date range. Spread Evenly: Choose this option when you want to force all the created items to fit between a start/end date that you specify. If you have more items than there are valid dates in your range, you will get multiple items on some or all dates; if you have fewer items than there are valid dates in your range, you will have one or more days between Assignments. Date Options: Set the Time/Block and Start Date and choose a 'Continue' option. Enter the Time/Block to be used for the created items. Time or Block will appear depending on your Program Options settings. If you have selected the Preset option, this field will be hidden as Time/Block information will come directly from your Preset entries. If there is no matching Preset entry, HSTOnline will follow the guidelines of the Daily option and set all Assignments to the 'all day' area. Enter a Start Date: Type in a date using the mm/dd/yyyy format or click or touch the Calendar icon to select a date. Continue until all remaining in Lesson Plan items are used: HSTOnline will begin with your Start Date and project Assignments as far into the future as necessary to use all the remaining, un-used items in each selected Lesson Plan for the Student. Continue until [Date]: HSTOnline will create Assignments using the selected Lesson Plans but stop when it reaches the date you enter no matter how many items remain in each Lesson Plan for the Student. If you choose the Spread Evenly option, 'Continue until [Date]' is the only option available because the definition of 'Spread Evenly' requires a defined date range. Type in a date using the mm/dd/yyyy format or click or touch the Calendar icon to select a date. Return to Active Plans to cancel this process and return to the Active Lesson Plans list for the Student. Continue to Preview to see the list of Assignments that will be created based on the options you have set. If you choose Continue to Preview, HSTOnline will show you the Assignments that will be created based upon your option settings. Use this opportunity to review the items before accepting them to be added to your database. The Preview will show you all items, sorted by date. You can group or sort the Preview list in any way you like and HSTOnline will remember those settings each time you return to the Preview list. 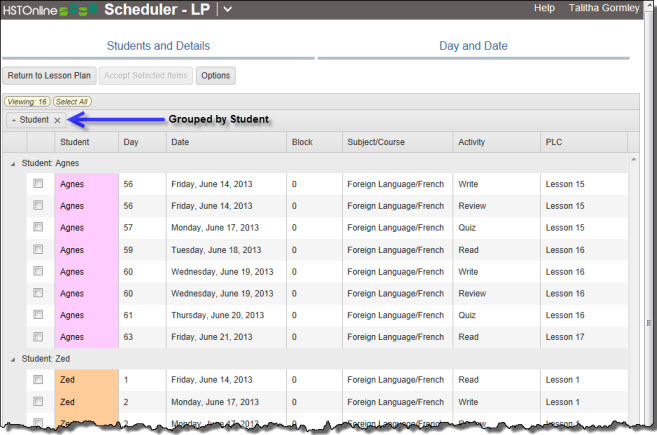 When using Scheduler, you may find it easier to group the preview by Lesson Plan so that you can see what's what. If the results are not what you expected, you can click or touch the Details or Day and Date tab to reset your options and then click or touch the 'Return to Preview' button to see the new results. you can click or touch the checkbox for each Assignment you want to accept. Accept Selected Items to add the highlighted Assignments to your Agenda. The Active Plans list for your Student will be updated accordingly, resetting the Remaining value and the Last Used date as appropriate. When using Scheduler from the Lesson Plan area, you can create Assignments for one or more Students from the same Lesson Plan. HSTOnline will pick up where you last left off with each Student in the Lesson Plan, or you can select specific items from the Lesson Plan to use with Scheduler. Items will be created to fill your selected date range, or until all the un-used Lesson Plan items have been utilized for each Student you have selected. 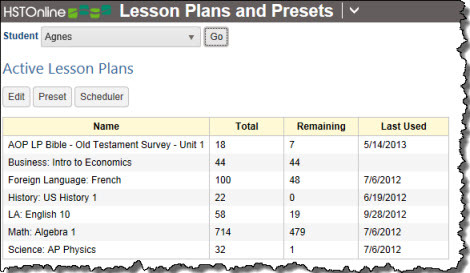 Set the Lesson Plan selector to view the Lesson Plan you want to work with. Click the checkbox for each Lesson Plan item you want to use. You can use your mouse to click and drag over contiguous Lesson Plan items in the list to select those items. On a touch device, you can touch and drag your finger over contiguous Lesson Plan items in the list to select those items. Click or touch the Action button and select 'Scheduler'. The Scheduler - LP form is a tabbed area with two sections: Students and Details and Day and Date. The active area is indicated by a dark blue line under the tab name. Student: By default, all Active Students for this Lesson Plan will be pre-selected. You may choose any Students you wish for this process. Details: HSTOnline will remind you the name of the Lesson Plan you are working with, and show the number of selected items or display 'all remaining items'. Return to Lesson Plan to abandon this process and return to the Lesson Plan you were viewing. Continue to Day and Date or touch the Day and Date tab to set those options. Set the pattern of days you want HSTOnline to follow when creating the Assignments. Choose to use the Preset, Daily, Weekly, Monthly or Spread Evenly option. Preset: HSTOnline will follow the days and times for the designated Subject or Subject/Course that you have set in the Lesson Plans and Presets area for the Student. If there is no matching Preset entry for the Subject or Subject/Course, HSTOnline will use the Daily option in creating those Assignments. Monthly: HSTOnline will gather a list of all dates that fall within your selected date range, cull the list to only those dates which match the date of the month or # day of the month you have selected (First Tuesday, Third Monday, etc.) and then remove from the remaining dates any that violate your 'Skip' settings. Finally, HSTOnline will place an Assignment entry on each remaining date in the date range. Continue until [Date]: HSTOnline will create Assignments using the selected Lesson Plans but stop when it reaches the date you enter no matter how many items remain in each Lesson Plan for the Student. If you choose the Spread Evenly option, 'Continue until [Date]' is the only option available because the definition of 'Spread Evenly' requires a defined date range. Type in a date using the mm/dd/yyyy format or click or touch the . Calendar icon to select a date. The Preview will show you all items, sorted by date. You can group or sort the Preview list in any way you like and HSTOnline will remember those settings each time you return to the Preview list. In the example above, we scheduled 'all remaining items' for Agnes and Zed. You'll see that Agnes' items start with Lesson 15 while Zed's entries start with Lesson 1. That is because the Lesson Plan items for Lessons 1-14 were already marked as 'Used' for Agnes. Again, when using Scheduler without pre-selecting items, HSTOnline will create Assignments for each selected Student based on the 'Used' status of each Lesson Plan item.